A small but distinctive diving bird, the whiskered auklet (Aethia pygmaea) is a gray, robin-sized bird, which sports a quail-like crest and three white plumes in breeding season. Like other alcids, the whiskered auklet can both dive and “fly” underwater, propelled by flapping wings and strong webbed feet. 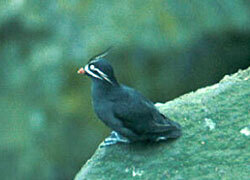 The bird breeds on rocky islands in Southwest Alaska and feeds in nearby tide-rips. At least some stay close by year-round, nesting in August. They are easily spooked and difficult to photograph before they flee. What makes the whiskered auklet special to birders is its rarity. The birds are found in only two places: in an arc from the Aleutians through the Commander Islands, and in the Kuril Islands between the Kamchatka Peninsula of Russia and Japan. Unalaska - in Baby Pass just east of Dutch Harbor between Unalaska and Akutan Islands.